Frogs, food, and frames, oh my! 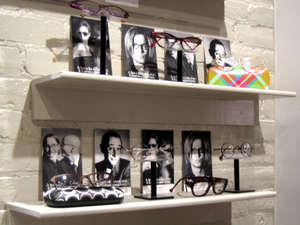 l.a.Eyeworks’ Melrose store had a great time hosting an ic! 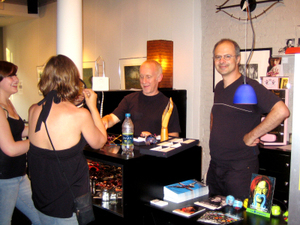 berlin trunk show. The two-day event featured the latest and greatest eyewear from the German geniuses. Fashionable frame fanatics along with ic! 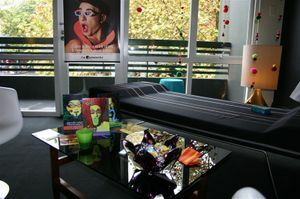 berlin devotees sipped and snacked as the l.a.Eyeworks staff made sure to keep the fun rolling. Also joining in on the festivites was local non-profit bike shop, Orange 20 Bikes. Friends from the shop were present to collect any spare bike parts that will be recycled to provide some wicked new wheels for the community. Check out the Melrose store photo album for some great shindig shots and frame photos from the show! 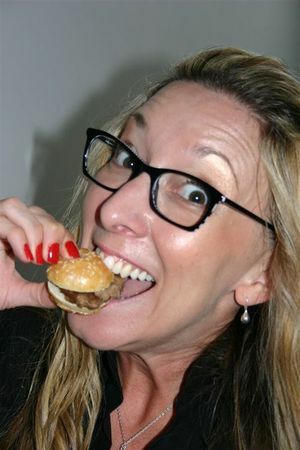 l.a.Eyeworks really knows how to throw a party – or a trunk show for that matter! 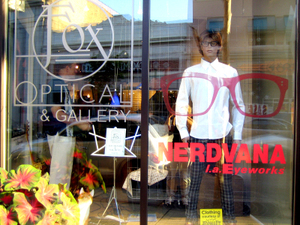 With our hip window concept “Nerdvana” adorning the storefront, our man in the East, Louis Schneider, threw an amazing looking l.a.Eyeworks trunk show at Fox Optical & Gallery in Bethlehem, Pennsylvania. Sporting his Bodhi frame in charcoal with palladium, Louis hosted the show by styling everyone in l.a.Eyeworks’ newest collection. Thanks for the images Louis! Here are some photos from a trunk show, by George Skoufis, that was put together in Australia! Our main man, Marco, helped throw the party at Eye Candy, which looks like it turned out to be quite the shindig! Shazam!